How Do I Pre-Cache a Bible for Offline use? You are able to "pre-cache" all the chapters for a specific language. This means that you can then read the entire Bible in that language without an Internet connection. Note: If you are also using the newer Equipd Bible app, make sure you have turned off the Transition feature in Admin > About. 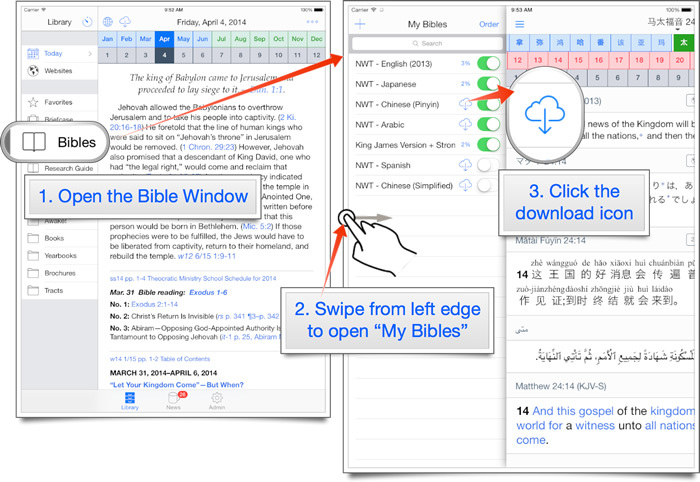 Otherwise the Bible window the current app will not open. If you need to you can add a new Bible to the list using the "+"
This will launch a window that shows the progress of the per chapter download. If something goes wrong during the download, don't worry - you can just close the window, and then click the "Pre-Cache All Chapters" button again. Any chapters already downloaded will still be there - you won't need to download them again. Can you make the download faster? It is quite slow. Yes, pre-caching takes a little while. Why? Because it is requesting one chapter at a time directly from jw.org (or in the case of the alternate Bible translations from the Equipd servers). No I will not be speeding this up by zipping copies of the files and placing them elsewhere to download, or any other mechanism. The whole idea is that Equipd is an empty shell, and you as the user populate it with the original source material direct from jw.org.